A ground rule single---how so??? A few years ago, Red Sox hitter JD Drew (yes, I'm a member of Red Sox Nation) hit a line drive at Fenway that bounced into the right field bullpen. The official scorer credited him with a single....how so? ? Re: A ground rule single---how so??? Bases loaded, tie game, bottom of 9th? Unless a HR is hit, batter is credited only with the number of bases needed to score the winning run. Good job, 'Bama, you nailed it. It was Game #5 of the Championship Series with the Rays , with R @ 3,tie game & bottom of 9th , when JD bounced a liner into the bullpen. The official scorer's announcement that it would be scored as a single didn't dampen the spirits of those of us from Red Sox Nation - that dampening came after game #7 ! 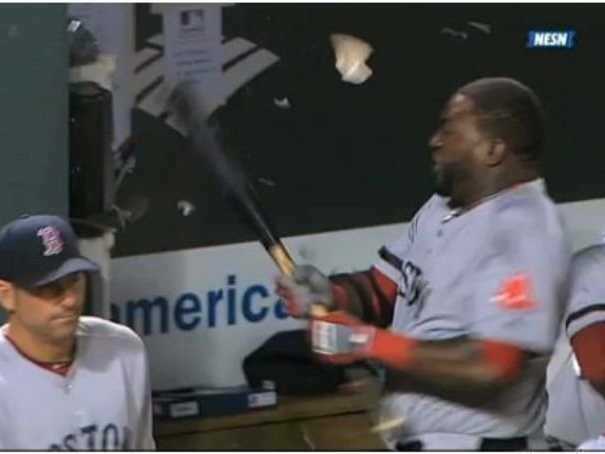 How was Big Papi's latest big hit scored? more to this topic, is it a "ground rule" single (is that its official term for the scenario)? - or is it merely scored a "single"? A strikeout and an error? TampaSteve - It's truly only a single. Boston scribes referred to it as a "ground-rule single". Boston scribes are not always correct ! Welpe & Maven - That was scored : Big Papi 1, telephone 0. It caused a dilemma for the manager to call the bullpen, though . Big Papi is still remembered in Red Sox Nation for his "motivational speech" at Fenway the day after the Patriots Day bomber was caught. The FCC forgave him, so I felt I should too. Some of his teammates did replace the phone the next day with a couple cans and some string.